If the militia of the parish was to exercise one Sunday, the same clothes might as well make a Sunday outfit for the other weeks, courtesy of the Crown. Blue was the natural choice for clothing that would emphasise civic duty and identity. I would recommend [for the superior infantry] only a plain blue cloath coat trim’d with gilt buttons, an hat laced with a gold lace of an inch broad, and white linen gaiters. … To admit no distinction of dress between the officers and soldiers of the militia, except the scarf or sash, seems agreeable both to oeconomy and good policy; for by that means all officers may save the needless expence of gaudy clothes, and be more secure in the day of battle, when the enemy cannot distinguish them at a distance from other men of the corps. [The subordinate heavy cavalry] to be well mounted, arm’d, and accouter’d, as our regular horse now are, but in uniform blue, faced with red, and trim’d with white metal buttons. I propose, that each man of the inferior infantry be cloathed in a uniform blue or green coat with white metal buttons, which may serve for a Sunday, and military dress. 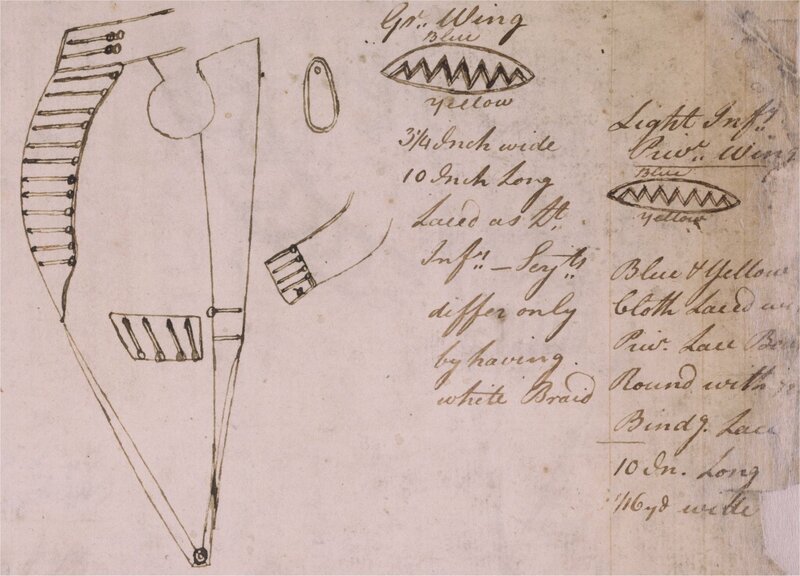 … cockades of different colours may be provided for the subordinate militia, horse and foot, suitable to their ensigns, by which each regiment of the county, and each company of subordinate foot may be distinguished from others. In places, this is not so much whimsical as far sighted, particularly on the reduction of distinctions between officers and men. Once again, blue is the dominant colour, and a Sunday best is provided for the “common people” into the bargain. So much for Norfolk, but that doesn’t mean that other regiments were clothed exactly the same. Later descriptions of their initial clothing tend to be vague and unsourced, and may be unreliable, so it’s hard to know. At any rate, within the space of a re-clothing their appearance became assimilated to that of the regulars, while during long periods of wartime embodiment the militia became, in effect, a second standing army. a very neat white uniform, turned up with light green, which we hear was presented to them by her Majesty. a light Uniform which will be their Property when they depart, and which particularly serves them during their Encampment on Account of its Lightness. The Appearance, also, of the City Militia might be rendered more respectable, by the addition of drill-jackets, with some proper distinction of uniform facings, to denote the ward or district of each company. And indeed, as I noted in this post, we find at that time the London Associators in a white drill dress faced blue, and the Newgate Street Association in white faced orange. Such a cheap, light and practical style of clothing might have made a sensible default outfit across all auxiliary forces, but it was not to be; subsequent generations of associators and volunteers found their own sartorial route, while the white jackets of the militia were put aside for fatigue wear, and became “slop dress”. While the familiar post-1799 infantry jacket didn’t allow for much in the way of variation, the immediately preceding transition period, as the long coat morphed by stages into the jacket, was far more fruitful. Here’s [left] a rather beautiful watercolour (attributed to Henry Eldridge) of an unidentified field officer of the Leeds Volunteers in the late 1790’s, from the collection of Leeds Museum. [Click to enlarge images.] The huge, plastron-like effect of the unusual lapels, with their buttons in threes, is quite a step forward from the orthodox parallel lapels with paired buttons originally worn by the Leeds regiment. The same flamboyant coat, but now cut to allow the lapels to button over in the mode of the time, is shown [right] in the 1802 portrait of Colonel Thomas Lloyd of Leeds (once at York Castle but now in the National Army Museum). Why buttons in threes? I’ve no idea. But the Leeds Volunteers were not the originators of the style. Here is exactly the same style of coat but faced in green, and a companion jacket, both belonging to an officer of the 1st West York Militia, probably Captain Howard of the light company. Both are now in the Wade Collection of the National Trust, together with a matching red waistcoat with buttons in threes. 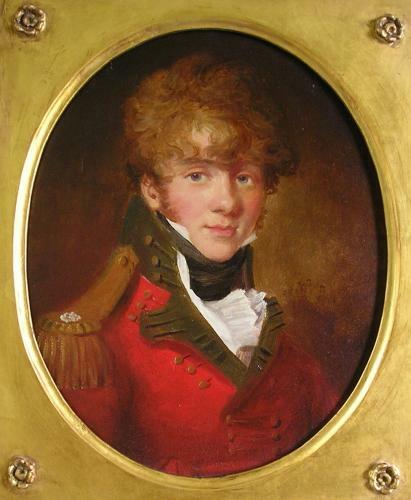 A portrait [below], attributed to John Downman, of a company officer of the West Yorks around 1800 or soon after shows the same coat buttoned over. But from where the West Riding Militia derived the style, or if it was ever adopted by any other unit, I do not know. Though here [below] is something else not too distant – a showy style of lapel worn in the late ‘nineties by both regiments of Gloucester Militia, and described in the Pearse tailors’ books as “Broad at top slanting off at bottom”.